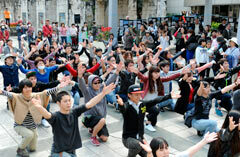 On February 11, young people's flash mob attracted attention from people in the public square in front of the Okinawa Prefectural Government Office, Naha. They mainly called for participation on Internet sites such as Facebook and practiced for three hours over two days. Fourteen students from Meio University in Nago took part. Chiharu Takikawa, a junior year student of the university was in charge of dance composition. “I focused on simple and sharp compositions which we could learn in a short time. We were able to create an opportunity to think and act for ourselves through the flash mob,” said she.